Okay, imagine this: in the mid-1980s a woman named Cheryl Sullenger, an abortion opponent, attempted to blow up a Womens Health Clinic in San Diego. She was caught, and in 1988 she and five other co-conspirators were convicted in a federal court of conspiracy. She served time in prison. On her release, Sullenger was hired as a senior policy advisor by Operation Rescue–which leaves one to wonder what sort of policy advice the group was seeking. In 2006 Sullenger filed a complaint with the Kansas State Board of Healing Arts against Ann Neuhaus, a doctor who offered a second opinion on a few late-term abortion cases. The law in Kansas requires a woman seeking a later-term abortion to obtain a second physician’s opinion. In eleven cases, Dr. Neuhaus found the patients had serious mental health issues and an abortion was advisable. Sullenger’s complaint claimed Dr. Neuhaus’ examinations weren’t thorough enough to merit that advice (though, of course, Sullenger believes a thorough examination would necessarily result in a decision against abortion). That complaint sat without a hearing until last week. In the intervening years, though, Sullenger provided a guy named Scott Roeder with information regarding Dr. George Tiller, the doctor who provided the abortion services on which Dr. Neuhaus offered her second opinion. Roeder later murdered Dr. Tiller as he attended church. In Roeder’s car, the police found Sullenger’s Operation Rescue telephone number. He told authorities he’d spoken to Sullenger on several occasions about ‘justifiable homicide’ in regard to protecting the life of the unborn. Sullenger said she provided Roeder with the information about Dr. Tiller ‘to be polite.’ She wasn’t charged with any crime. Several months ago the governor of Kansas–Sam Brownback, an abortion opponent–appointed a lawyer named Rick Macias to the State Board of Healing Arts. Macias had, at one time, represented Operation Rescue. And suddenly that complaint filed by Sullenger way back in 2006 got a hearing. Can you guess what happened? Of course you can. 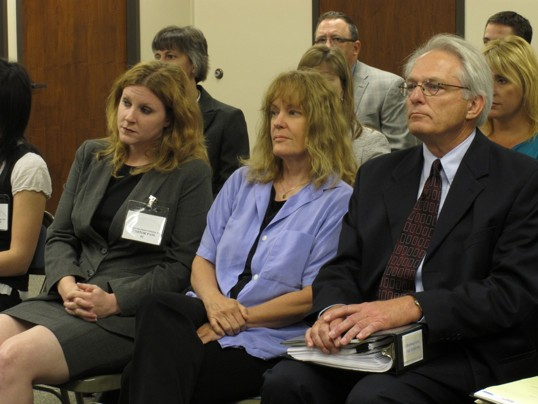 On Friday the Kansas State Board of Healing Arts revoked the medical license of Dr. Ann Neuhaus. Just to be clear, let me repeat this. A complaint filed six years ago by a woman convicted of attempting to bomb a medical clinic and who is an associate of a man convicted of assassinating a doctor who performed a legal medical procedure is heard by a committee appointed by a governor who is opposed to that legal medical procedure–a committee on which sits a lawyer who represented a group opposed to that legal medical procedure, and that committee decides to revoke the medical license of a doctor for the offense of offering a second opinion on eleven cases involving that same legal medical procedure. For the record, let me say I dislike the need for abortions. I wish nobody ever had to make that decision. But it’s a decision that belongs to a woman in consultation with her doctor. Let me also remind folks once again that this is a legal medical procedure. For now. Let me also say there is something deeply un-American about people who are so intent on imposing their religious and moral values on everybody else. It is why we call it Brownbeckistan. Going to start carrying a burqa in my car for when I have to cross the state line here.